The Nasdaq-listed company is looking to acquire companies handling back-office operations for US and European clients, primarily in insurance support and related operations, according to an investment banker who spoke on condition of anonymity. Such a move is expected to strengthen Cognizantâ€™s insurance practice, which has focused primarily on the property and casualty insurance industries. 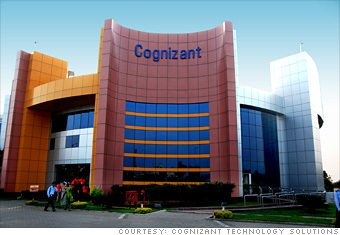 Cognizantâ€™s net profit for the quarter ending March 31 rose to $151.5 million (Rs 660 crore), up 34 per cent from a year earlier and 5.2 per cent quarter-on-quarter. Revenues for the first quarter rose to $959.7 million (Rs 4,222 crore), up 28.7 per cent from $745.9 million (Rs 3,278 crore) in the first quarter of 2009. Revenues in 2009-10 are expected to be at least $4.1 billion (Rs 18,860 crore), up by at least 25 per cent over 2009.